To say the French take their bread seriously is a genuine understatement. 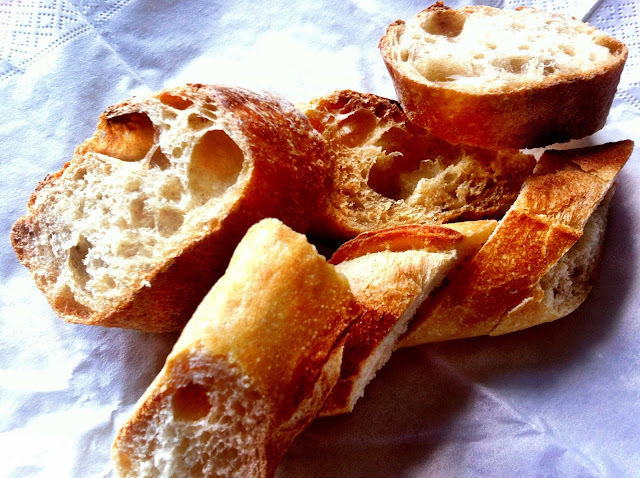 The ubiquitous French baguette is the cornerstone of French meals and a common sight everywhere in Paris. 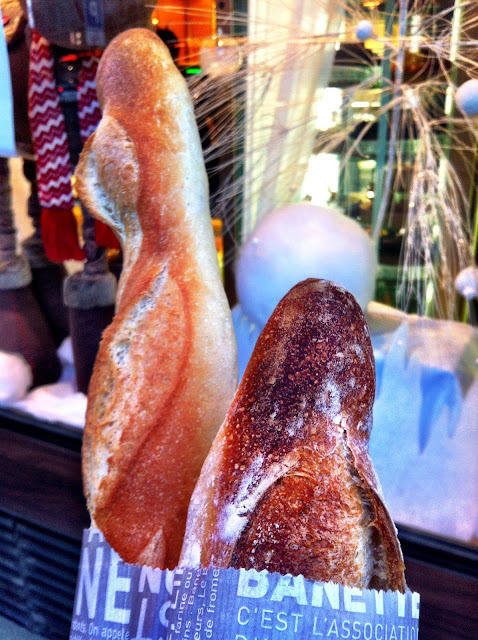 I still unashamedly get a kick out of walking on the streets of Paris holding a freshly baked baguette in my hand. It makes me feel a little Parisienne (except for the giveaway grin on my face because I'm so chuffed at feeling like such a 'local' - which now that I think about it, isn't very Parisienne at all). The French tradition of a daily (sometimes twice daily!) trip to the boulangerie to pick up a baguette or two is something I have grown to love and respect. 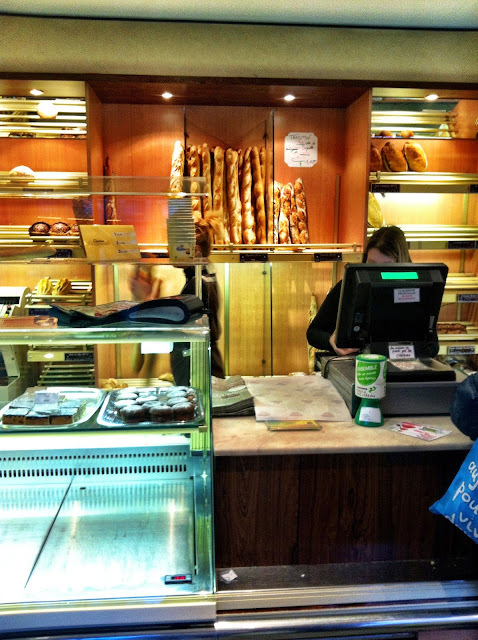 Keeping small family owned boulangeries in the quartier in business, developing rapport with your local boulanger and other local customers and respecting and appreciating the quality of the daily baguette is another. True purist Frenchies will scrunch their noses at the thought of industrially produced supermarket bread. Frenchie is one of them. Unless it's an artisanally hand made baguette from a local boulanger, it's not worth eating he insists. And to be honest at first I thought he was a bit of a bread snob but now I've grown to notice and appreciate the difference as well. A good baguette fresh out of the oven is deeply golden and crusty on the outside yet oh so bouncy and squeezy and a little chewy on the inside! If you can spot varying sized holes on the inside as well as slightly pointy ends (that prove it was made by hand), you're onto a winner. It's so good that I have found myself doing that quintessential French ritual of lining up in the queue with my correct change to pick up a fresh out of the oven baguette and then breaking off the "elbow - le coude" to munch on while I walk back home. It now doesn't surprise me to learn that there are actual French laws dictating what ingredients are allowed in a baguette, as well as upper limits of allowable 'fillers' in order to ensure that a high standard of quality is always maintained. There is another law that governs the use of the word 'boulangerie', you cannot call your bakery a 'boulangerie' unless your bread is made and baked on the premises, (which is fair enough - no frozen mass produced baguettes to just be baked allowed!). And lastly, come August when Parisians head off on their annual Summer vacation, there is another law that comes into play - specifiying that a certain number of boulangeries MUST REMAIN open in August in each quartier, in order not to leave the people of France baguette-less! Every year, the best boulangeries of Paris compete against each other for the highly coveted Best Baguette in Paris Award. 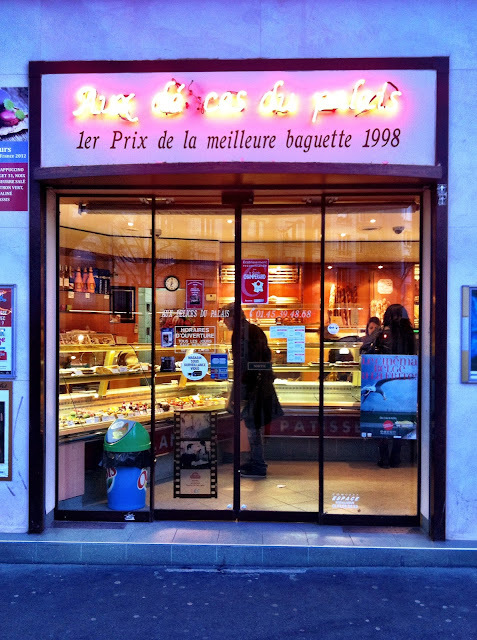 The winning boulangerie then has the prestigious honour of supplying baguettes to the Élysées Palace for the upcoming year. Aux Délices du Palais in the 14th arrondissement took out the first prize which is sure to skyrocket their business in the coming year. I dropped by their boulangerie soon after the result was announced a while back. Turns out they won the prestigious award in 1998 as well! Probably time for an update of their sign! I love their hand written A3 sign in their front window to display their prestigious accolade. It beautifully conveys the charm of Paris that always makes me feel like I live in the past. Inside, the shelves were nearly empty. Good thing I arrived in time, there were only half a dozen of the prize winning baguettes left! 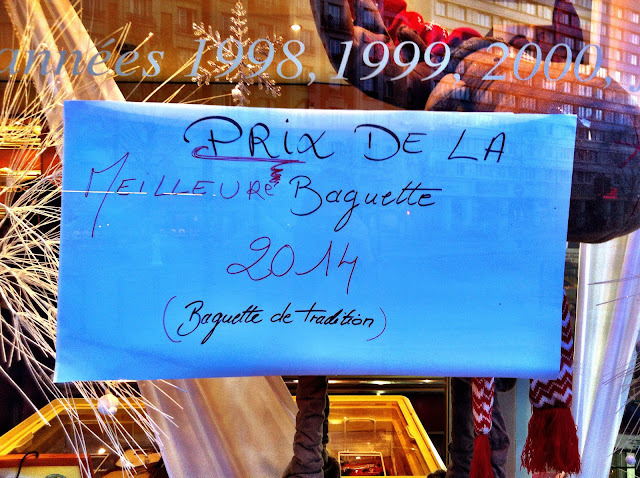 I bought a normal standard baguette as well as the prize winning "baguette de tradition". Back home, we did a taste test between Frenchie and I, firstly the baguette on its own, then accompanied by a generous wedge of camembert, then with a serving of rillettes and finally some strong roquefort. 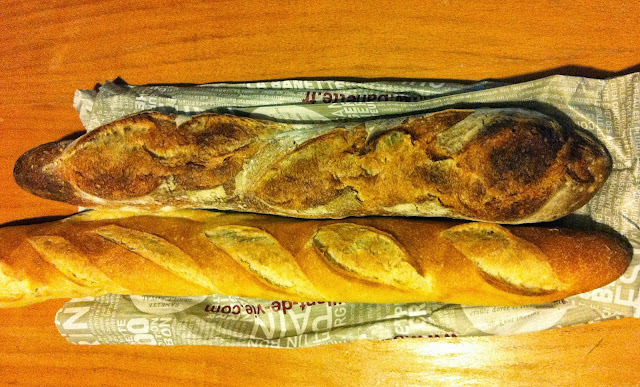 The standard baguette was the longer one and the prize winning 'baguette de tradition' was the shorter one. Notice the different sized holes I was talking about - which gives the bouncy chewy texture of a good baguette. 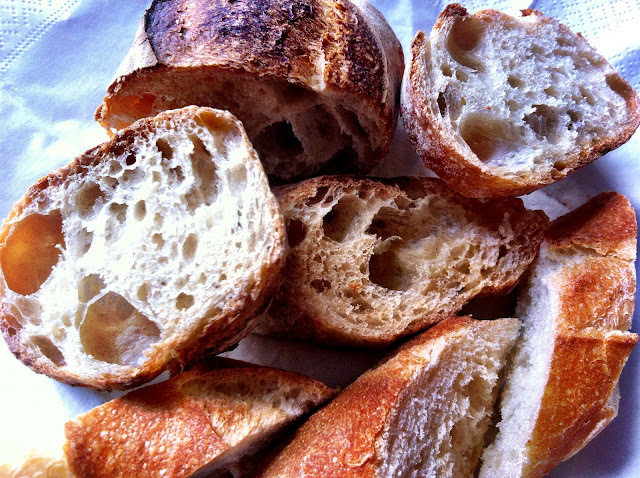 Check out the Best Baguette of Paris for 2014 - voted by a jury consisting of 15 members, including the winner of the 2013 Best Baguette of Paris. The 187 baguettes that entered the competition were judged by baking, taste, crust, smell and appearance. All baguettes had to be between 55cm and 65cm, weighing in between 250gm and 300gm as well as not exceed a salt content of more than 18 grams per kilo of flour. thank u for sharing.... we dun get good baguette in singapore. i miss paris. It's so true, it's not the same. I recently went back to Australia and went through the same thing! It just wasn't the same. It's in the flour, the yeast, the special conditions set by French law as to what constitutes a baked-on -premises-baguette...? It tastes so nice, even on its own ;) sorry I'm making it worse for you! Why Musée d'Orsay is so "easy to do"